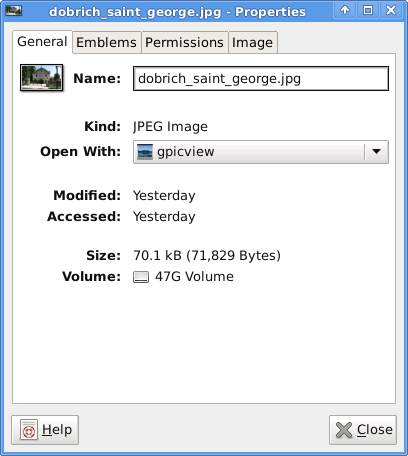 a) picture opening time in GIMP loading is significantly higher if compared to a simple picture viewer program like Gnome's default, eye of the gnome – eog. Both of the programs support picture changing, so if you open a picture you can switch to the other ones in the same directory as the first opened one. To change GIMP's default PNG, JPEG opening I had with mouse right button over a pic and in properties change, Open With: program. If you're curious about the picture on on all screenshots, this is Church – Saint George (situated in the city center of Dobrich, Bulgaria). St. Georgi / St. George Church is built in 1842 and is the oldest Orthodox Church in Dobrich. In the Crimean War (1853-1856) the church was burned down and was restored to its present form in 1864.
gpicview is another cool picture viewing program, I like. Unfortunately on Slackware, there is no prebuild package and the only option is either to convert it with alien from deb package or to download source and compile as usual with ./configure && make && make install . This entry was posted on Saturday, March 17th, 2012 at 10:37 pm	and is filed under Linux and FreeBSD Desktop, System Administration. You can follow any responses to this entry through the RSS 2.0 feed. You can leave a response, or trackback from your own site.